Urns add interesting touches in all four season. Like garden obelisks, decorative outdoor stone urns add visual focal points and interest in all four season of the garden. Decorative outdoor stone urns come in a great variety of sizes, shapes and materials. Decorative stone urns were used in ancient times. Many were cast in terra cotta or pottery by skilled workers. Marble and other materials were also carved into decorative urns. Urns were decorated with handles, leaf motifs, and masks depicting gods and goddesses. They often served functional purposes too, such as storing wine and water, as well as ceremonial and decorative purposes. Throughout the centuries, decorative outdoor stone urns were frequently used in gardens and on the terraces and balconies of the wealthy to denote taste and style. Famous palaces such as Versailles had marble urns in which the flowers were removed daily and changed to suit the whims of the nobility. From Renaissance Italy throughout all of Europe, outdoor stone urns were the hallmark of elegance. The use of outdoor stone urns declined from the 18th through the early 19th centuries as a more naturalistic style of gardening came in vogue. Instead of formal garden layouts, park like settings were built that included man made lakes and ponds and natural-looking trees and hedges. Garden ornaments were using sparingly, if at all. With the advent of the Victorian period, decorative outdoor stone urns came into fashion once more. Victorians loved urns of every shape and size, from metal to stone, and the more elaborate the better. Urns were used as central points in the garden, accents at the entrance way, or on terraces and patios. Elaborate planting styles including ivy and cascading flowers enhanced both stone and metal urns. Today, stone urns remain a classic way to accent the garden. Concrete rather than marble is the main material, although other types of stone may be used. Durable, cast concrete is affordable for most people and lasts a long time. Decorative outdoor stone urns can be an investment, so before buying one on the spur of the moment, think about how you will use it. Planters are the obvious use for outdoor stone urns. If planting flowers in an outdoor stone urn, be sure to choose an urn with drainage holes. 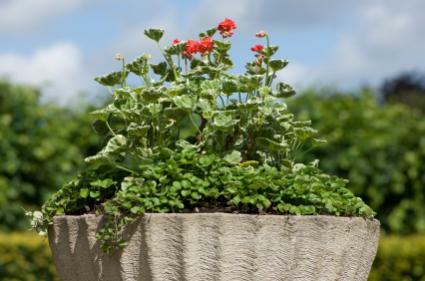 If the urn does not have a drainage hole, plant flowers inside a plastic pot with good drainage holes. The pot should sit inside the urn so that it doesn't show from the outside. A pot that sinks too deeply into the stone urn can be raised using foam packing peanuts. Simply line the bottom of the stone urn with foam packing peanuts and set the pot right on top. They're simple, economical, and provide good drainage. One or more urns can be placed in the garden. If choosing urns to flank the entrance to a garden, it's a good idea to choose matching urns. Small urns can be made to look larger by planting conifers and topiaries in them, or raising up the urn by placing it on a stone pedestal or plinth. A large, ornate urn can be raised up and placed at the back of the garden as a focal point. Used in this way, it becomes more like a statue rather than a planter. Keep the background simple and try planting an evergreen hedge behind the urn to show off its stylish features. Place a fountain pump and rocks inside an urn to make a bubbly fountain. A clear sheet of Plexiglas placed over the top transforms a tall urn into a garden table. Two short urns with a sheet of Plexiglas affixed to the top can be used to make an unusual garden bench. Florida Plants provides a pottery store with various urn styles, from contemporary to traditional. Old House Web provides a group of links to various sources of garden urns. Garden Fountains offers a good variety to choose from.